A new year, and another new season for the KTA- but this year’s debut event is unlike any that we’ve ever done before. 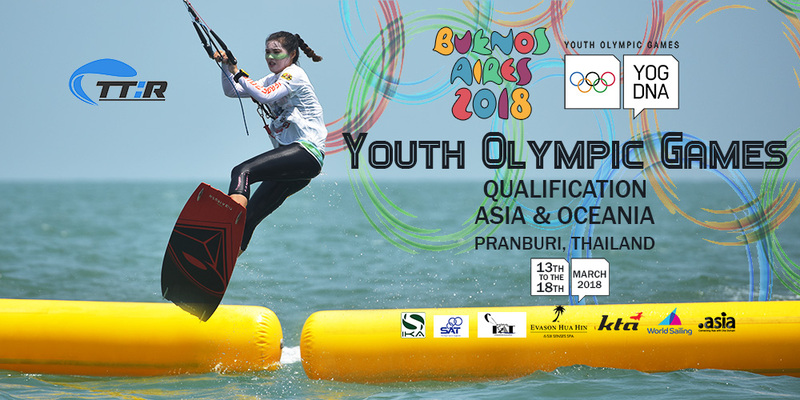 Taking place in Pak Nam Pran, Thailand, the KTA and the Kiteboarding Association Thailand will be co-hosting the Asia-Oceania regional kiteboard qualifiers for the upcoming Youth Olympic Games, which are set to be held in Buenos Aires in October of this year. This event, supported by the Sports Authority of Thailand and Iconic Studio, will be the third and final regional qualifier for the IKA Youth Olympic trials, following on from the Americas event in Cabarete, and the European-African event in Dakhla. Should there be any young Olympic hopefuls who still have yet to make the cut, they will have a final chance at qualifying during the TT:R Youth Slalom World Championships in Boao, China at the beginning of May. As many of us within the sport are well aware of, kiteboarding’s road to the Olympics has been a rocky one so far. It briefly looked as though kiteboarding would be included in the 2012 Olympic Games, but a quick-fire decision from the powers that be reversed the vote, and sent kiteboarding back to the bench for another few years. Yet 2018 sees the tables turning as the sport makes its way to the Olympic arena this October for the very first time. After much speculation from all of us in the sport, it’s been decided and approved by the IOC that the format for the Youth Olympic competition will be TT:R (twin tip racing) slalom/boardercross. This action-packed, high speed style of downwind racing brings riders right up to the shoreline as they navigate their way through a zig-zag of buoys and obstacles. The TT:R slalom boardercross format was officially trialed for the first time in Pak Nam Pran in March 2017 with great success. It was a new format for everybody, so initially, there were plenty of struggles for the riders to overcome while they adjusted to the new style of riding. Countless tangles and crashes later, riders were loving the quick-fire style of racing. We heard plenty of feedback from riders about how enjoyable (and challenging) it was to work on their downwind technique and slalom racing strategy. Meanwhile, spectators on the beach were thrilled to have the race action brought so close to the shoreline. The upcoming competition will take place on the same stretch of beach as last year’s event (just a few hundred meters up the road) from the 13-18 of March 2018. First, though, the Thai Nationals will kick off the week of competition with two days of racing on the 10th and 11th. During the event, any riders who are registered to compete in the YOG qualifiers will be eligible to walk away with their very own pro-athlete website provided by one of this year’s sponsors, Dot Asia. Supported by members of the KTA Media, the Dot Asia team will be on site to speak with any young rider who wants to have their own website created for them. All they’ll need to do is fill out the information on their profile and the Dot Asia tech geniuses will do the rest. Check out the Extreme Nomads guide to Pak Nam Pran for insider tips on local riding conditions, things to do, places to stay, and awesome food to try while you’re there. From all of us at the KTA, we invite you to come and join us on the beach in Pak Nam Pran. The more the merrier! In the meantime, we’re collectively sending massive support to all of the young riders who are already preparing for the big day. Get the latest news in the lead up to the event on the event Facebook page. Looking forward to seeing you all in a few short weeks!